"The Year 1812" redirects here. For calendar year 1812, see 1812. The Year 1812, festival overture in E♭ major, Op. 49, popularly known as the 1812 Overture, is an overture written in 1880 by Russian composer Pyotr Ilyich Tchaikovsky to commemorate Russia's defence of its motherland against Napoleon's invading Grande Armée in 1812. The overture debuted in Moscow on August 20, 1882, conducted by Ippolit Al'tani under a tent near the then-unfinished Cathedral of Christ the Saviour, which also memorialized the 1812 defense of Russia. The overture was conducted by Tchaikovsky himself in 1891 at the dedication of Carnegie Hall, in what became the first time a major European composer visited the United States. The overture is best known for its climactic volley of cannon fire, ringing chimes, and brass fanfare finale. It has also become a common accompaniment to fireworks displays at outdoor concerts throughout the world. The 1812 Overture went on to become one of Tchaikovsky's most popular works, along with his ballet scores to The Nutcracker, The Sleeping Beauty, and Swan Lake. ↑ "Open" instrumentation consisting of "any extra brass instruments" available. In some indoor performances, the part may be played on an organ. Military or marching bands also play this part. ↑ Sometimes substituted with tubular bells or recordings of carillons. ↑ In the sections that contain cannon shots, actual cannon are sometimes replaced by recorded cannon or played on a piece of staging, usually with a large wooden mallet or sledgehammer. The bass drum and tam-tam are also regularly used in indoor performances. Beginning with the plaintive Russian melody of the Eastern Orthodox Troparion of the Holy Cross (also known as "O Lord, Save Thy People") played by four cellos and two violas, the piece moves through a mixture of pastoral and martial themes portraying the increasing distress of the Russian people at the hands of the invading French. This passage includes a Russian folk dance, At the Gate, at my Gate ("U Vorot, Vorot"). At the turning point of the invasion—the Battle of Borodino—the score calls for five Russian cannon shots to counter a fragment of La Marseillaise, the French national anthem. A descending string passage represents the subsequent retreat of the French forces, followed by victory bells and a triumphant repetition of O Lord, Save Thy People as Moscow burns to deny winter quarters to the French. A musical chase scene appears, out of which emerges the anthem God Save the Tsar! thundering with eleven more precisely scored shots. The overture utilizes counterpoint to reinforce the appearance of the leitmotif that represents the Russian forces throughout the piece. A total of 16 cannon shots are written into the score of the Overture. The music can be interpreted as a fairly literal depiction of the campaign: in June 1812, the previously undefeated French Allied Army of over half a million battle-hardened soldiers and almost 1,200 state-of-the-art guns (cannons, artillery pieces) crossed the Niemen River into Lithuania on its way to Moscow. The Holy Synod, aware that the Russian Imperial Army could field a force only a fraction of this size, inexperienced and poorly equipped, called on the people to pray for deliverance and peace. The Russian people responded en masse, gathering in churches all across the Empire and offering their heartfelt prayers for divine intervention (the opening hymn). Next we hear the ominous notes of approaching conflict and preparation for battle with a hint of desperation but great enthusiasm, followed by the distant strains of La Marseillaise as the French approach. Skirmishes follow, and the battle goes back and forth, but the French continue to advance and La Marseillaise becomes more prominent and victorious – almost invincible. The Tsar desperately appeals to the spirit of the Russian people in an eloquent plea to come forward and defend the Rodina (Motherland). As the people in their villages consider his impassioned plea, we hear traditional Russian folk music. La Marseillaise returns in force with great sounds of battle as the French reach Moscow. The Russian people now begin to stream out of their villages and towns toward Moscow to the increasing strains of folk music and, as they gather together, there is even a hint of celebration. Now, La Marseillaise is heard in counterpoint to the folk music as the great armies clash on the plains west of Moscow, and Moscow burns. Just at the moment that Moscow is occupied and all seems hopeless, the hymn O Lord, Save Thy People that opens the piece is heard again as God intervenes, bringing an unprecedented deep freeze the French cannot bear (the winter winds blow in the music). The French attempt to retreat, but their guns, stuck in the freezing ground, are captured by the Russians and turned against them. Finally, the guns are fired in celebration and church bells all across the land peal in grateful honor of their deliverance from their treacherous and cruel enemies. The opening segment, O Lord, Save Thy People is sung a cappella by a choir instead of being played by cellos and violas. A children's or women's choir is added to the flute and cor anglais duet rendition of At the Gate, at my Gate. The orchestra and chorus unite in the climax with a triumphant version of O Lord, Save Thy People and God Save the Tsar. On September 7, 1812, at Borodino, 120 km (75 mi) west of Moscow, Napoleon's forces met those of General Mikhail Kutuzov in a concerted stand made by Russia against the seemingly invincible French Army. The Battle of Borodino saw casualties estimated as high as 100,000 and the French were masters of the field. It was, however, ultimately a pyrrhic victory for the French invasion. With resources depleted and supply lines overextended, Napoleon's weakened forces moved into Moscow, which they occupied with little resistance. Expecting capitulation from the displaced Tsar Alexander I, the French instead found themselves in a barren and desolate city, parts of which the retreating Russian Army had burned to the ground. Deprived of winter stores, Napoleon had to retreat. Beginning on October 19 and lasting well into December, the French Army faced several overwhelming obstacles on its long retreat: famine, typhus, frigid temperatures, harassing cossacks, and Russian forces barring the way out of the country. Abandoned by Napoleon in November, the Grande Armée was reduced to one-tenth of its original size by the time it reached Poland and relative safety. Although La Marseillaise was chosen as the French national anthem in 1795, it was banned by Napoleon in 1805 and would not have been played during the Russian campaign. It was reinstated as the French Anthem in 1879—the year before the commission of the overture—which can explain its use by Tchaikovsky in the overture. However, "Veillons au salut de l'Empire" which served as the unofficial anthem of Napoleon I's regime had been largely forgotten by 1882, while educated Russians of the time were likely to be familiar with the tune of La Marseillaise recognized its significance. Although God Save the Tsar! was the Russian national anthem in Tchaikovsky's time, it had not been written in 1812. There was no official Russian anthem until 1815, from which time until 1833 the anthem was Molitva russkikh, "The Prayer of the Russians," sung to the tune of God Save the King. In 1880, the Cathedral of Christ the Saviour, commissioned by Tsar Alexander I to commemorate the Russian victory, was nearing completion in Moscow; the 25th anniversary of the coronation of Alexander II would be at hand in 1881; and the 1882 All-Russia Arts and Industry Exhibition at Moscow was in the planning stage. Tchaikovsky's friend and mentor Nikolai Rubinstein suggested that he write a grand commemorative piece for use in related festivities. Tchaikovsky began work on the project on October 12, 1880, finishing it six weeks later. Organizers planned to have the overture performed in the square before the cathedral, with a brass band to reinforce the orchestra, the bells of the cathedral, and all the others in downtown Moscow playing "zvons" (pealing bells) on cue—and cannons, fired from an electric switch panel to achieve the precision the musical score required. However, this performance did not take place, possibly due in part to the over-ambitious plan. Regardless, the assassination of Alexander II that March deflated much of the impetus for the project. In 1882, during the All-Russia Arts and Industry Exhibition, the Overture was performed in a tent next to the unfinished cathedral. The cathedral was completed on May 26, 1883. Meanwhile, Tchaikovsky complained to his patron Nadezhda von Meck that he was "... not a conductor of festival pieces," and that the Overture would be "... very loud and noisy, but [without] artistic merit, because I wrote it without warmth and without love." He put it together in six weeks. It is this work that would make the Tchaikovsky estate exceptionally wealthy, as it is one of the most performed and recorded works from his catalog. In Russia during the Communist era, the Tsar's anthem melody was replaced with the chorus "Glory, Glory to you, holy Rus'!" (Славься, славься, святая Русь!) from the finale of Mikhail Glinka's opéra A Life for the Tsar; a historical drama about a patriotic commoner, Ivan Susanin. With the end of the Soviet Union, the original score returned. As a rousing patriotic hymn, the Overture has subsequently been adapted into and associated with other contexts than that of the Russian fighting. The 1812 Overture is popularly known in the United States as a symbol of the United States Independence Day, a tradition that dates to a 1974 choice made by Arthur Fiedler for a performance of July 4 of the Boston Pops. In a live performance, the logistics of safety and precision in placement of the shots require either well-drilled military crews using modern cannon, or the use of sixteen pieces of muzzle-loading artillery, since any reloading schemes to attain the sixteen shots or even a semblance of them in the two-minute time span involved makes safety and precision impossible with 1800s artillery. Time lag alone precludes implementation of cues for the shots for fewer than sixteen 1812-era field pieces. Antal Doráti and Erich Kunzel are the first conductors to have encouraged exact fidelity of the shots to the written score in live performances, beginning in New York and Connecticut as part of Dorati's recording, and Kunzel in Cincinnati in 1967 with assistance from J. Paul Barnett, of South Bend, Indiana. Dorati uses an actual carillon called for in the score and the bells are rung about as close to a zvon as then known. The art of zvon ringing was almost lost because of the Russian Revolution, when many of the bells were destroyed. The earliest traceable orchestral recording, by the Royal Albert Hall Orchestra conducted by Landon Ronald, was issued by HMV on three 12-inch 78rpm sides in 1916. A Royal Opera Orchestra recording of about the same time contains no shots at all. Antal Doráti's 1954 Mercury Records recording with the Minneapolis Symphony Orchestra, partially recorded at West Point, and using the Yale Memorial Carillon in New Haven, Connecticut, uses a Napoleonic French single muzzleloading cannon shot dubbed in 16 times as written. On the first edition of the recording, one side played the Overture and the other side played a narrative by Deems Taylor about how the cannon and bell effects were accomplished. (Later editions placed the commentary after the performance on side 1 and the Capriccio Italien on side 2.) A stereophonic version was recorded on April 5, 1958, using the bells of the Laura Spelman Rockefeller Memorial Carillon, at Riverside Church. On this Mercury Living Presence Stereo recording, the spoken commentary was also given by Deems Taylor and the 1812 was coupled with Tchaikovsky's Capriccio Italien. Later editions coupled the 1812 Overture with Dorati's recording of Beethoven's Wellington's Victory, which featured the London Symphony Orchestra and real cannon. Kenneth Alwyn's early stereo recording for Decca used a recording of slowed-down gunfire instead of cannon fire. Robert Sharples and the London Festival Orchestra released a recording in 1963, later remastered in quadrophony by Decca. The Black Dyke Mills Brass Band has also recorded a brass band arrangement of the piece. This recording includes the cannon shots as originally written. In 1990, during a worldwide celebration of the 150th anniversary of Tchaikovsky's birth, the Overture was recorded in the city of his youth by the Saint Petersburg Philharmonic Orchestra using 16 muzzleloading cannons fired live as written in the 1880 score. That recording was done within earshot of the composer's grave. The festival was televised for the first time in USA on March 9, 1991. In 1971, CBS released a recording with the Philadelphia Orchestra conducted by Eugene Ormandy, also featuring the Mormon Tabernacle Choir, the Valley Forge Military Academy band and real artillery shots. British rock drummer Cozy Powell sampled the overture at the end of the track "Over The Top" in his eponymous 1979 studio album. In 1989, the Swingle Singers recorded an a cappella version of the overture as part of an album whose title is, in fact, 1812. The Texan band "The Invincible Czars" released a rock version of 1812 Overture for the bicentennial of the Battle of Borodino in September 2012. 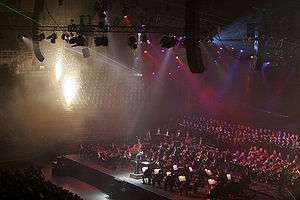 The band had already debuted their arrangement of the piece at the 20th annual OK Mozart classical music festival at Bartlesville, Oklahoma, with professional orchestra musicians, in June 2009, complete with fireworks at the finale. In the sci-fi fantasy show Farscape, John Crichton converts a DRD to belt out the overture in order to ground him and help maintain his focus. He even paints the French flag on the droid and labels it "1812". The piece is featured prominently in the film V for Vendetta. The melody of Dan Fogelberg's top ten hit "Same Old Lang Syne" is drawn from the distinctive leitmotif that represents the Russian forces in the piece. In "Ratchet & Clank Future: A Crack in Time", The RYNO V weapon plays the 1812 Overture while firing. The piece begins with a Russian liturgical hymn, O Lord, Save thy People. This hymn represents the praying for deliverance from the invading army. A part of this hymn translates to "Grant victory to all Orthodox Christians over their enemies." By including this hymn in the piece, Tchaikovsky is suggesting that God granted the Orthodox Russians victory over the Revolutionary French. Later in the piece when La Marseillaise is played, it seems as though the Russians will lose the battle. Then O Lord, Save thy People, along with God Save the Tsar!, is played powerfully in the brass section with a strong display of chimes in the background. The ringing chimes are written to represent the bells of Moscow. The bells of Moscow have such a huge influence on Russia because, in the Orthodox religion, the bells represent an icon of the voice of God. At this moment in the piece, the Russian should feel great pride for their country. In the years following the premiere of the 1812 Overture, national pride in Russia was higher than it had been in decades. ↑ "Tchaikovsky Research : The Year 1812, Op. 49 (TH 49)". Retrieved June 21, 2015. ↑ Lax, Roger; Frederick Smith (1989). The Great Song Thesaurus. Oxford: Oxford University Press. p. 230. ISBN 978-0-19-505408-8. 1 2 Felsenfeld, Daniel. Tchaikovsky: A Listener's Guide, p. 54. Amadeus Press, 2006. ↑ Cross, Milton (1969). The Milton Cross New Encyclopedia of the Great Composers and Their Music, Volume 2. Doubleday. p. 1034. ↑ Ewen, David (1978). Musicians since nineteen hundred: performers in concert and opera. Hw Wilson Company. p. 186. ISBN 0-8242-0565-0. ↑ Robinson, Harlow (2012). Rzhevsky, Nicholas, ed. The Cambridge Companion to Modern Russian Culture. Cambridge University Press. p. 268. ISBN 1-107-00252-4. ↑ Tchaikovsky, Piotr Ilyich (1996). 1812 overture: Marche slave, and ; Francesca da Rimini. Courier Dover Publications. ISBN 0-486-29069-7. Retrieved December 29, 2009. 1 2 "University of Texas: Lecture slides" (PDF). University of Texas. Retrieved July 20, 2008. ↑ Tchaikovsky's 1812: The Multimedia Festival Overture. Future Vision Multimedia. Nanuet, NY, 1994. 1 2 "Battle of Borodino". Encyclopædia Britannica. 2010. Archived from the original on January 21, 2010. Retrieved January 6, 2010. 1 2 Zamoyski, Adam (2004). Moscow 1812: Napoleon's Fatal March. London: HarperCollins. ISBN 0-00-712375-2. ↑ "Igor Buketoff transcription". singnet.som. Retrieved October 9, 2008. ↑ Ross, Stewart (2002). The French Revolution Events and outcomes. Evans Brothers, p. 69. ISBN 0-237-52292-6. ↑ Bohlman, Philip Vilas (August 2004). The Music of European Nationalism: Cultural Identity and Modern History. ABC-CLIO. p. 157. ISBN 978-1-85109-363-2. Retrieved September 13, 2011. ↑ "Official website of the Cathedral of Christ the Saviour". Cathedral of Christ the Saviour. Retrieved January 10, 2010. ↑ "Cathedral of Christ the Savior in Moscow: A Russian Allegory". Retrieved January 10, 2010. ↑ "Churches Around the World Archive". Retrieved January 10, 2010. ↑ Andrew Druckenbrod. "How a rousing Russian tune took over our July 4th". Post-Gazette. Retrieved July 4, 2015. ↑ Everett Evans. "How did the '1812 Overture,' become a Fourth tradition?". Hearst Newspapers. Retrieved July 4, 2015. ↑ Matthew Linder. "Independence Day Staple, the "1812 Overture" is a Story of God's Sovereignty Over Human History". Christ and Pop Culture. Retrieved July 4, 2015. ↑ Mordden, Ethan (1986). A guide to orchestral music: the handbook for non-musicians (Reprint, illustrated ed.). Oxford University Press US. ISBN 978-0-19-504041-8. ↑ "Tchaikovsky: 1812 Overture: The New Recording". Telarc International. Archived from the original on March 27, 2008. Retrieved July 20, 2008. ↑ "Rescued Russian bells leave Harvard for home". Harvard University Gazette. danilovbells.com. July 7, 2008. Retrieved January 13, 2010. ↑ Smith, Alfred Emanuel (1927). "New Outlook-Volume 145". Outlook Publishing Company, Inc. p. 24. Retrieved January 17, 2010. ↑ Kozinn, Allan (September 24, 2009). "Wilma Cozart Fine, Classical Music Record Producer, Dies at 82". New York Times. Retrieved January 17, 2010. ↑ "Classics Online: Symphonic Brass". classcisonline.com. Archived from the original on January 31, 2010. Retrieved January 16, 2010. ↑ "Eugene Ormandy, Philadelphia Orchestra*, Mormon Tabernacle Choir, Valley Forge Military Academy Band – Tchaikovsky: 1812 Overture". Discogs. Retrieved August 15, 2016. ↑ "1812 – The Swingle Singers". ↑ "SoundtrackINFO: V for Vendetta Soundtrack". www.soundtrackinfo.com. Retrieved August 15, 2015. ↑ "Frequently Asked Questions". Dan Fogelberg. 2003. Retrieved June 14, 2011. ↑ Micholic, Peter. "Aftershocks of 1812: Nationalism and Censorship in Tchaikovsky's 1812 Overture". Adventures in Music History and Literature at St. Olaf. Retrieved December 12, 2014. ↑ Starmer, W. (1916). "The Great Bell of Moscow". The Musical Times. 57 (887): 442. ↑ Batuman, Elif. "The Bells". The New Yorker. Retrieved December 12, 2014. ↑ Micholoc, Peter. "Aftershocks of 1812: Nationalism and Censorship in Tchaikovsky's 1812 Overture". Adventures in Music History and Literature at St. Olaf. Retrieved December 12, 2014. Russian national anthem "God Save the Tsar" in Tchaikovsky's music – contains several audio recordings of the 1812 Overture.